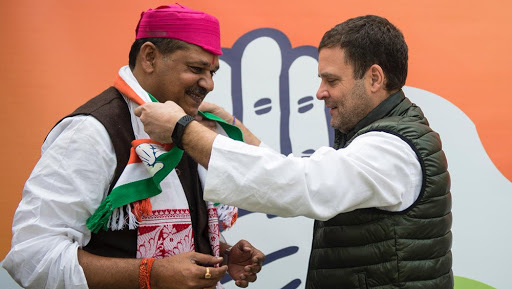 Patna, February 18: Months after being suspended from Bharatiya Janata Party, Lok Sabha parliamentarian and former cricketer Kirti Azad on Monday joined Congress in the presence of party president Rahul Gandhi in Bihar’s Darbhanga. The local MP won the 2014 Lok Sabha seat from this constituency on a BJP ticket and expected to contest the 2019 polls from here. Taking to Twitter, the son of former state chief minister Bhagwat Jha Azad informed, “Today in front of Shri Rahul Gandhi I joined the Congress I felicitated him in traditional Mithila style.” According to the Congress party sources, Azad was supposed to join the party on Friday, but it was delayed due to the terrorists attack on the CRPF convoy on Thursday in Pulwama. In the attack, 40 CRPF personnel were martyred, while the convoy was passing on the Jammu-Srinagar highway, an explosive-laden SUV rammed into the bus. Lok Sabha Elections 2019: Priyanka Gandhi to Visit Varanasi Amid Cadre's Call For Her Candidacy Against PM Modi. Earlier, informing the details of the delay of joining he had tweeted, “Good morning today 18th February I will be joining @INCIndia in front of @RahulGandhi ji and my press conference will be held at AICC headquarters 24 Akbar Road in Delhi at 1 p.m.” It is to be known that Azad was thinking of joining the Congress after he was suspended from BJP, following a tiff with Union Finance Minister Arun Jaitley on the alleged Delhi & District Cricket Association scam. With the induction of Azad joining Congress weeks before the Lok Sabha elections is a jolt to the political front of BJP in the state, as allies are seen unsatisfied with the party ruling both the nation and state. BJP had won 22 seats in 2014 Lok Sabha elections, while its ally LJP won six. However, Nitish Kumar’s JDU couldn’t win a single seat. It’s opposition, RJD won four seats, while Congress managed to win two seats.